Ranking in the last quadrant in terms of luck among the 12 zodiacs in 2019, challenging times are ahead. You are in direct "confrontation" with the Tai Sui causing you many obstacles, hassles, troubles and challenges. Indicated by Sui Po star (Year Breaker), this will cause you pitfalls and changes in your career, relationship, wealth and health. Unlucky stars outnumber lucky stars in your constellation giving you many challenges ahead. Your career outlook looks gloomy. There are more malevolent stars than lucky stars in your constellation. Your prospect in 2019 is determined by the volume of hard work you put in. The absence of powerful good stars to counter the looming of powerful bad stars will need you to keep yourself safe from trouble. Risk of physical injuries is highly indicated. You will see heavier work load in your career without any benefit. Backstabbers and gossips aplenty. Wealth luck and windfall luck are bleak, so please be wise with your financial portfolios. You will foresee many travel opportunities which may leave you feeling isolated from your loved ones. You are likely to obtain useful network from someone far. Business owners should explore foreign markets to reap success. First and foremost, Yue Kong star (Monthly Emptiness) can turn mishaps into good luck, although it cannot reduce negativities when it stands alone, but can combine forces with the other stronger stars to reduce negative impacts. Since you do not have any other stronger lucky star, this star alone has no power. Another average star Tian Ma star (Sky Horse) denotes countless travel opportunities. If you are developing abroad, it offers fresh perspectives. For those who have no plan to go abroad, you will not benefit from the year unless you move to a new house. Moving to a new place will transform your luck into good. On the downside, the Lan Gan star (Trouble) will derail all your plans and mislead you to believe that everything looks like good opportunity and trap you into pitfalls. Next, the inauspicious Da Hao (Great Consumer) star will most likely cause a big hole in your pocket. This star accompanies the zodiac in confrontation with the Tai Sui every year. You will be spending on a large sum of money unnecessarily. Every undertaking is against your wishes. From wealth perspective, you will experience financial losses because your wealth luck hits the pit this year. You are likely to spend a fortune on wastage or unexpected events. You will face debts by friends and customers leading to cash flow problems. You are also advised not to make impulsive decisions in investment and stock purchase. Be alert at all times in order not to fall prey to cheats and conmen. What is more worrisome, the charging of Pi Tou star (Peeling Head) star suggests possible demise of the elderly of the family, friends or relatives. To prevent you from putting on mourning cloths, you need to pay attention to the elderly and be mindful of preventive measures. Do not be lackadaisical or ignore this warning. Devote more time to be spent with your loved ones who matter most and remember that the lasting memories will be of family and love. If you are away from your loved ones, follow your heart to lead you back home. Health wise, you are vulnerable to frequent ailments. You will also be prone to injuries and accidents. Your love life is challenging because you feel low spirited and emotion charges up regularly. Singles are unlikely to meet anyone new due to poor peach blossom luck. Romance luck is negative and you are most likely going to breakup. Career Empowerment - Display the Tai Chi Ox at your work desk or in your living room. 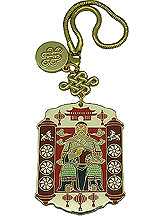 Carry along or keep in your work bag the Heaven's Flag Amulet. Prevent Opportunity Losses - Display the 5 Elements Pi Yao in the SE. Dispel Vile Characters - Display the Four Friends in the west (direction of relationship) and the Hanging Fireballs in the south (direction of gossip). To neutralize troublemakers, carry along Chundi's Fan-Mirror in your work bag. Health - Display the Twin Wulou by your bed. Love Enhancement - Keep the Nine Tailed Fox Amulet under your pillow.